Cpl. Jason Morrow proposed to his wife last year at home plate in Angel Stadium. He later threw out the first pitch at a playoff game. Now the ballclub comes to terms with his death in Iraq. Marine Cpl. Jason Morrow was serving a tour in Iraq when he wrote his mother with a fanciful request. When he returned to Southern California on leave, he wanted to propose to his girlfriend, Evelyn Flores. And he wanted to do it on the field at Angel Stadium, where he had spent so many summers cheering for the team. It took some negotiating, but his mother, Kristin Morrow, arranged it. And last summer, Morrow dropped to one knee and presented an engagement ring to Flores behind home plate. Players congratulated him, and manager Mike Scioscia invited him to stand by the dugout for the national anthem. The team was so impressed with Morrow — both by his service in Iraq and his lifelong devotion to the Angels — that they invited him to return in October to throw out the first pitch before a playoff game against the Chicago White Sox. Morrow, who turned 27 in January, returned the honor by sending the team a scrapbook he made detailing his time in Iraq and his love of Angels baseball. "Thank you for making my wish come true," Morrow wrote in a letter to the team upon returning to Iraq. "I will always be a fan." Last week, the Angels received another message — this one from Kristin Morrow. "It has been awhile since we have spoken," the e-mail began. "This morning we were told that Cpl. Jason Morrow had been killed in action in Iraq. … I wanted you to know that what you did for our son also means the world to us. It means so much to Jason. Your kindness was enjoyed by some very special people in Jason's life." Tim Mead, Angels vice president for communications, who helped arrange Morrow's visits to the stadium and also became a friend, said he was hit hard by the news. He spread the word to staff, the players and coaches. Mead showed Scioscia the e-mail from Kristin Morrow and later posted in the Angel clubhouse an obituary of Morrow printed in the Press-Enterprise in Riverside, where Morrow grew up. He attended Buena Vista High School in Corona. The obituary was next to the "thank you" letter Morrow wrote the team, which also detailed how proud he was to be a Marine and how he believed he was fighting to secure Iraq's freedom. "It was difficult," Mead said. "We had the utmost respect for him." Scioscia had met Morrow only twice, but Mead said the manager also was struck by the Marine's death. Mead and Scioscia talked about Morrow's service in Iraq, and Scioscia said he would always remember Morrow standing next to him for the national anthem. When Morrow threw out the first pitch of the playoff game, he gave Mead a scrapbook he had made that chronicled his months overseas and the day he proposed to his wife, whom he married last year. Inside were photographs of Iraqis Morrow had met, with a caption: "The people I fight for so that they can have peace." Mead represented the Angels at Morrow's funeral Friday at Riverside National Cemetery. "He knew his Angels history," he said. "When he talked to the players, they didn't hear a lot of Iraqi stories. He wasn't gung-ho. He was more like, 'Golly, I get to go down on the field.' I could tell it meant everything to him. He was a special young man. Just someone who wanted to give back to his country." Morrow was a machine gunner on a Humvee when he was wounded by an improvised explosive device in Balad. He died June 27. 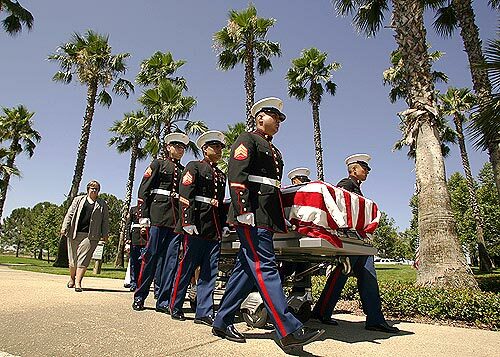 His body arrived in the United States on the Fourth of July, his father's birthday. Jason Morrow had taken the machine gunner's role just over a week after the previous gunner, one of his best friends, had also been killed by a roadside bomb, said his father, William Morrow. Evelyn Morrow and Kristin Morrow were both presented with Morrow's Purple Heart at the funeral. Kristin Morrow held up a tattered gray teddy bear, which she said Morrow's grandfather had given to him when he was sick as a child. "I wish he had it in Iraq," she said. She then held up a camouflage hat Morrow had given her that she now takes to work. "I'll put it on because it makes me feel close to him," his mother said. William Morrow said his son had wanted to be a Marine since he was a boy. He loved the idea as much as the notion of playing for the Angels. Neil Morrow, one of Morrow's cousins, penned a song called "War and Baseball" that he sang at the funeral. "The Angels are calling, they've got you on their side," the chorus started. "Heard about your big play. Write your name in the sky." The ballclub is working on one last tribute to the fallen Marine. Mead is collecting signatures from players, coaches and staffers on a bat they plan to present to Jason's family.